It is increasingly hard to keep the mood up once the days get shorter and temperatures plunge. It gets dark earlier and days seem oh, so short. The urge to just wrap in something warm without giving it much thought is very strong. I have my secret: I plan my outfit to the last detail and it gives me a boost to shoot me out of the door, no matter the weather. Believe it or not, my weakness for all kind of accessories has the power to get me through the day. A stylish combination works wonders for my mood and energy level. And.... here I go. I rummage though the knitwear, hats and shawls, bags and statement necklaces. Timeless black is a staple. Stylish and never boring, especially when you accentuate with a striking contrast. Starting with the knitwear. Warm and soft slouchy hats and shawls in grey and black. A a suede and leater rucksack, both casually comfortable and very elegant. 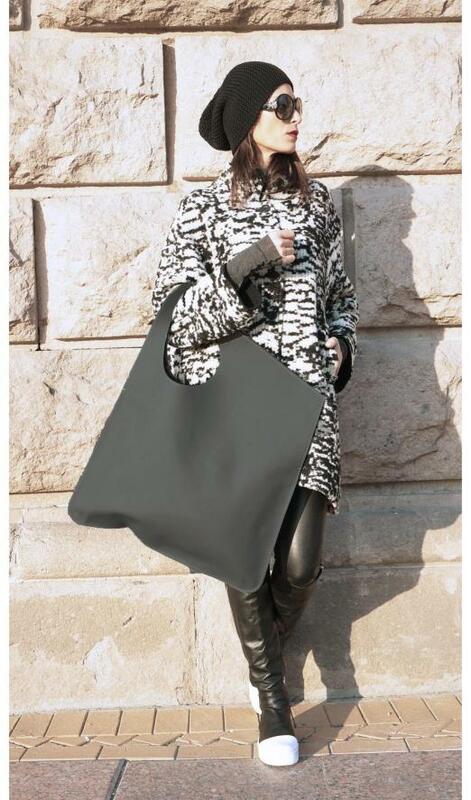 Going onto a stunning contrast coat in white and black and an incredible black matt bag. A soft high collar vest, that is fantastic under the coat warmer. A statement necklace to remember, matching nicely the grey slouchy knit hat. Leather boots, leggings, sleeve warmer, turtle neck sweater, drop crotch pants, sporty sneakers..